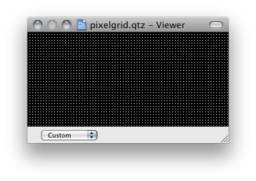 Generates an infinite grid of pixels with the specified spacing. Must be me I guess, but I installed the virtual macro and can find it in the Patch Library, but no pixel grid ensues into any renderer patch like Billboard or Sprite. Yes, but once I updated the installed macro from the version _0 then it began working - I wonder if I haven't got something askew with my QC cache ? Restarting QC seemed to get the macro running from the updated composition. Now its working - cheers. Actually get the same result bypassing the Motion Blur on rechecking. Seems like such a straight-forward tool -- I don't understand why this is what I see when sending to a Billboard. 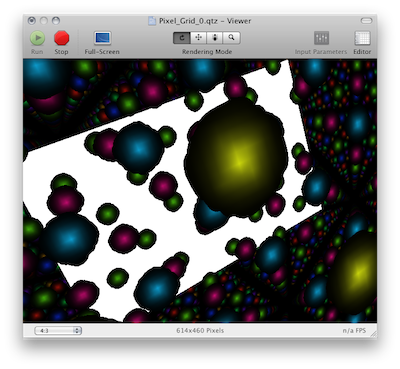 I am using Crop to Destination but all the crop tools produce the same results, and when I drag the corner of the viewer window different patterns of pixels form in the black space. Am I missing something obvious? These kind of "crop" situations come up for me. Maybe solving this issue is an opportunity to understand a little more about cropping in general in QC. What hardware are you using? Can you try it on other hardware? Hm, that doesn't happen for me. What hardware are you using? does it happen with other objects (sphere, cube, etc.)? 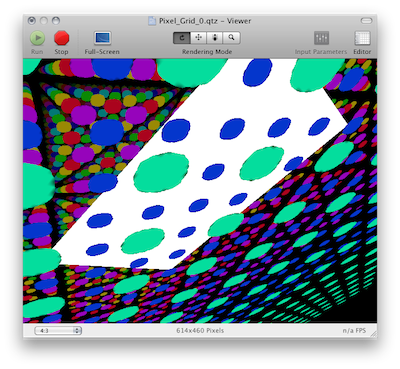 If not, it's a gl torus bug, but if so, it could be a subtle texture pipeline quirk. I can on Monday. Right now I'm on an older machine -- 2.16 Macbook Pro with an X1600. This simple, clear patch allows me to ask a couple newb questions about Core Image. Is it possible within the CI patch to mask the white ("pixel") part? 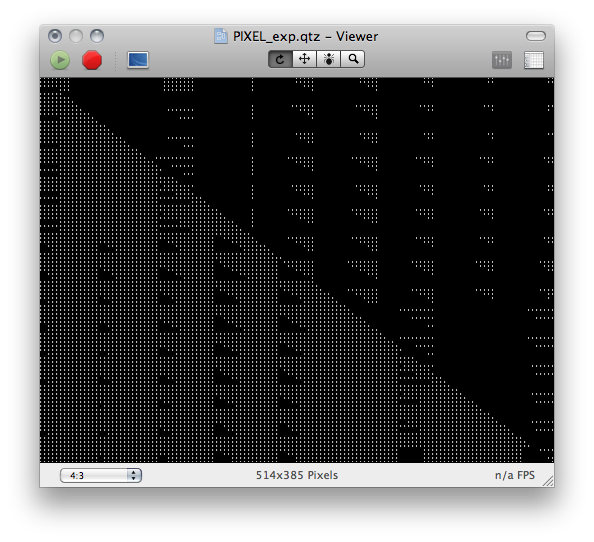 Is it silly to ask if there are other ways to interpolate a "pixel" other than bilinear? Why does the grid pattern create an "X" (Actually "X" with "+")?